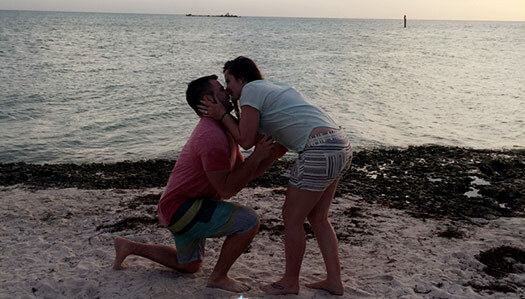 SHARE YOUR PROPOSAL STORY WITH US! Tim and I went to Arizona for our senior year of college spring break. We spent the week hiking and sight-seeing and had the best time. We were hiking on our final day there (we had already hiked 3 other mountains), and decided to stop short of the top to watch the sunset from where we were at. Tim was getting the GoPro set up to catch a “Timelapse of the sunset” when a couple of other hikers walked by and offered to take a nice picture with the sunset in the background (we did NOT know them). 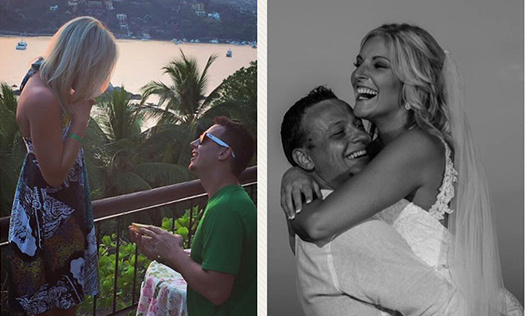 The first picture is our normal picture and then BAM out of nowhere, Tim’s on one knee asking me to marry him! That day's experiences were laid out perfectly for this moment to happen (even though none of experiences were what Tim had planned 😂) and I am in awe of God’s presence throughout the entire day. My parents had recently moved to Alaska in the fall of 2017 and I had planned to visit over spring break with a friend in March of 2018. Andrew & I had both visited Alaska the winter prior and fell in love with all of the scenery on many hiking trails, with our favorite view being the Eagle River Nature Center. Visiting Alaska with a friend, I had no clue a special visitor would be arriving in the later part of the trip. My mom had told me we were going to take family photos at the nature center with a friend of theirs who is wanting to build their portfolio. As we had hiked to the spot, we started on the landing that hovers over the river and is surrounded by mountains. Andrew was waiting at the end of the landing with a dozen roses, champagne, and the ring!! I had absolutely no clue this was happening. I actually didn’t even recognize him until he reached out to grab my hand and greeted me (still a funny moment to us both)! Of course he got down on one knee and popped the question, in which I said YES!! Both of my parents were there capturing the moment and enjoyed a celebratory glass of bubbly. And to think this wasn’t the end of the best surprise... After we drove back to my parents home in Chugiak, Alaska, I had a dozen more roses, chocolate strawberries, more champagne, and a basket of wedding planning goodies! Andrew then told me we needed to get ready, as he had plans to take me to dinner at the Crows Nest in Anchorage. This restaurant is on the top floor of a hotel with a 360-degree view of both the mountains and the bay. It was a perfect moment to end such a special and thoughtful day! To be totally surprised with the perfect ring in the presence of my family at my favorite place, was above and beyond what I could have imagined for an engagement! 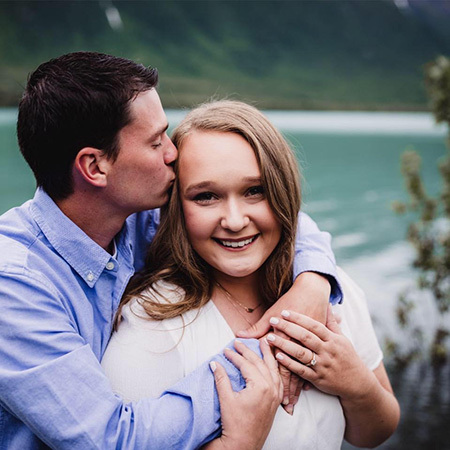 That following summer, we got to return to Alaska to take our engagement photos, which was very special! 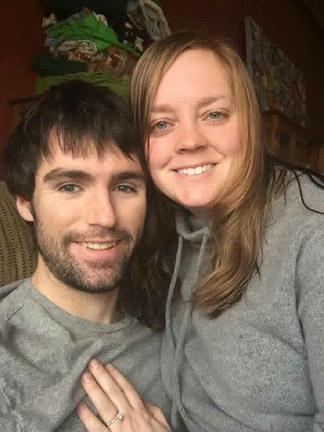 Now we are planning to be married on May 18th, 2019 in our hometown! 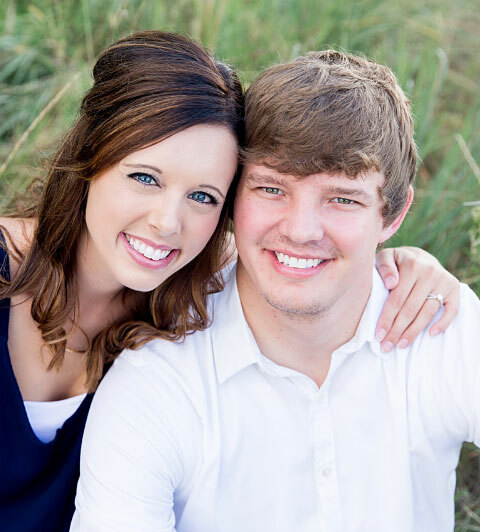 With the engagement being so special, we can’t wait to see how magical our big day is!! Andrew surprised me with a weekend trip to AZ. All he would tell me is that I was going to have fun and to not do any research as to what events could be happening in Phoenix over the dates we were there (an extremely hard thing for me not to do). Turns out his surprise was the he had purchased VIP tickets for my favorite band (the Goo Goo Dolls) for their 20th anniversary tour of Dizzy Up the Girl. I was shocked to say the very least. Not only were the tickets VIP, they were the highest level of VIP, which included a private meet & greet with John and Robby after the show! Long story short, we had just completed our private backstage tour pre-show and Andrew tells me that he has to make a work call. I say "ok, I'll get our drinks and save us a spot, but hurry up because general admission will be let in soon". He left and was gone for what felt like forever. He finally came back soaking wet and I asked what happened. "I was on the phone out in the rain" he replied. To which I said "oh, ok" and promptly turned around, excited for the show. After the show we went backstage to meet John and Robby, and I was SO EXCITED. While we are talking with them, our backstage liaison, Jenna, says something along the lines of "oh we have a couple of celebrations today". Turns out it was Robby's birthday, so we of course say happy birthday and whatnot, and then they all kind of just stop and stare at me. It was super weird, so I turn to look at Andrew, like, maybe I missed something? And there he was on one knee! I, of course, said yes! It turns out he had no real plan to propose, but had brought the ring just in case. After the backstage tour, he just felt it was the perfect time, and so he ran all the way to our hotel to go get the ring! It was the most amazing surprise. Collin and I met at Western Michigan University in Kalamazoo Michigan before moving out to Fargo, North Dakota. During 2016, our first winter in the great white north, we took a trip to Jaco, Costa Rica. The trip was absolutely amazing. We did so many memorable things from zip lining to deep sea fishing. Fast forward 3 years in what has been the coldest winter we have experienced in North Dakota, we vacation back to Costa Rica. Although, I did not anticipate this trip topping our unforgettable first trip, I was in for a surprise. During the first night in Jaco, it was decided we would have dinner with Collin’s parents at the best spot in the area with a beautiful mountain top sunset view. However, our 15 minute car ride to the restaurant turned into an hour and a half traffic jam up the mountain. At this point I was getting hungry in the backseat grumbling “can we turn around”, and “let’s go somewhere else” as everyone else in the car responds “NO! !” We FINALLY, get to the parking lot of the restaurant 10 minutes before sunset. Everyone’s doors fly open and they start running up what seemed like 15 flights of stairs, while I am being told to “hurry, the sunset doesn’t wait” as I walk nonchalantly to the destination. When we get to the top we are welcomed with the most beautiful restaurant and sunset view. Within moments of arriving Collin walks me over to the amphitheater stairs. I only trip over myself a little when I see at the bottom of the stairs rose petals in the shape of a heart await. Collin then says words I will never forget, and drops down to one knee. I came to realize our unforgettable first trip to Jaco was topped, and sometimes it pays off to be a little hu(A)ngry. We were in Virginia Beach, VA visiting Caleb's family over the Christmas season. It was a Saturday and our first time heading to the beach. We drove separately to accommodate everyone. His oldest sister got to the beach earlier than us and was there when we arrived (she actually hid the ring box in the sand & marked it). We were walking on the beach admiring the view and enjoying the weather; suddenly, Caleb pretended to "trip" on a pencil as we were walking. He got down and started digging and "found" a Ziploc bag with a box in it. He acted like he had no idea what it was, proceeded to open the bag and the first box. It wasn't until that point that I realized it was a ring box. He took the second box, got down on one knee, and asked me to marry him. 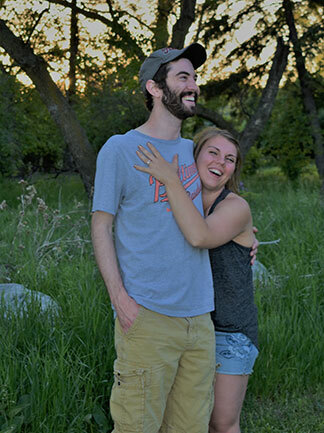 We are excited to begin our lives together and get married in June! After church on Easter morning, Bryant surprised me with an "Easter basket" filled with all my favorite things. Among the treats was a beautiful Bible with my first name paired with his last name engraved in gold lettering on the cover. As I was admiring it, Bryant got down on one knee and proposed with the ring. Not the Easter morning I was expecting!! Matt has taken me on adventures since I first met him, so when he suggested we go on a spontaneous trip to Aspen I was all for it. Neither one of us had seen the Maroon Bells, the most iconic pair of mountains in Colorado. We left early Friday morning, and the 4 hour drive was beautiful. Because the weekend forecast had turned stormy, we went straight to the Bells to get pictures before the clouds rolled in. We hiked to the first lake and got a great family picture – me, Matt, and his dog Allie. We hiked past the second lake and started running into snow on the trail on the way to the third lake. Off the trail we went, and Matt was showing me how to pick out landmarks to find our way back. We had a virtual reality camera with us that records 360 degree video, and Matt set it up on a log at the top of a hill where we started playing with it, seeing what we looked like from different angles. I didn’t know it, but he had started recording a video. After telling me he loved me and a myriad of other sweet things, he got down on one knee and asked me to marry him. I looked at the ring and exclaimed, “It’s so sparkly”! and said yes. Allie came back from exploring to celebrate with us, and we stood there for a bit, taking in the beautiful mountains and patches of snow that surrounded us. Sometimes when girls grow up they think about their wedding day and future husband. That just wasn’t my reality. My reality was dreaming of helping those whom struggle with substance abuse. However, as the years of failed relationships continued I questioned if finding my soul mate was in Gods plans. The years went on and single handedly I raised my son as I fulfilled my dream job. Life was good. Life was content. What I did not know was God had much bigger plans for Emmytt and I. Plans they included Michael. Although our love story starts with Bumble. Little did I know he lived across the street from my sons daycare or that we have mutual friends. From continuous dates or love blossomed. From his ability to always adore me for whom I am, his acceptance of my son and his adoration for me in his eyes lead to butterflies that developed into love. His willingness to accept my open door to helping others, genuine care for family and daughter his mother never had allows our relationship to exist smoothly. Over the years, I have learned what true unconditional love is. A feeling that is hard to explain but minimal description of it just is what it is. We work. We are. We knew when we knew. And we know, that forever we are. On a hot Summer day, days before the Fourth of July (my favorite holiday) we took a hike up Inspiration Peak at the lake. A view of Minnesota, the beautiful lakes and a memorial walk. At the top, he asked for my hand in marriage. After being together for three and a half years, Alex decided to surprise me by proposing to me over Labor Day weekend. Alex had to work that day and I was out of town for the day so when I came back into town we grabbed something to eat for supper and went to his house. When I got to his house the patio had lights, a fire, and roses. He proposed to me in his backyard on a gorgeous Saturday evening as the sun was setting. He even had his aunt, who is a photographer, catch all the action. 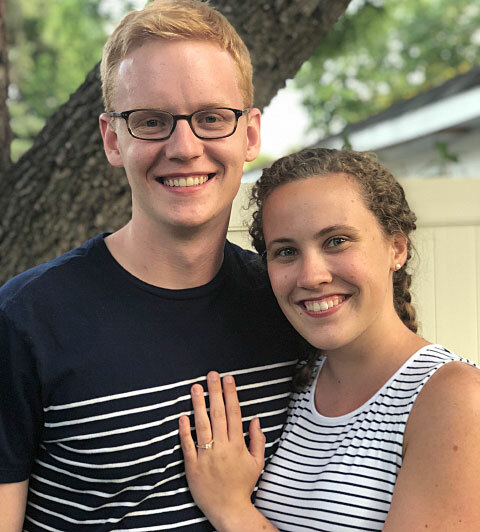 We cannot wait to get married October of 2019! 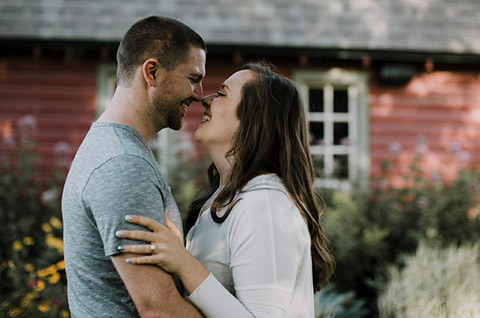 Colby and I had been dating for eight years prior to our engagement, and I was beginning to think that we were never going to get engaged, much less married. The extended time only added to my complete surprise when he had finally asked me to marry him! The weekend before heading home for the holidays I had planned to get my hair cut and colored. Prior to leaving for my appointment; however, I had asked my now fiancé, Colby, if he would like to go downtown afterwards for supper. Little did I know, I had initiated the first step into the night that forever will change my life. Lucky for us, Colby worked downtown near Island Park in Fargo, and per his suggestion, to avoid "limited parking", we parked at his work even though it was multiple blocks away from where we planned to eat. The walk was cold, but we enjoyed our warm meal at a nice restaurant. As we were about to leave, and after we payed for our tab, I noticed Colby's watch notifying him of a high heart rate. He shrugged it off and told me not to worry - a "technical problem" he said. I was clueless. We started our walk back to our vehicle, and Colby insisted that we detour through Island Park. With a lot of coaxing on his part, I finally gave in and we walked through the dark, tree-lined park. As we approached the gazebo within the park, I noticed that it was lit up so pretty within the snow. We got a little closer, and I began to see rose petals lining the path with candles sitting in an array on the gazebo steps. At that time, I didn't know if my life was about to change, or if Colby was unintentionally ruining some other girls wonderful moment, haha! Everything from here happened so quickly. By the time I reached the steps, I also saw a card with my name on it. I began to open it, and at that time, Colby was down on one knee. With much excitement, I said yes!!! We are currently planning our wedding, and will be excitedly married December 28th, 2018!! Sanders and I have been dating ever since the middle of high school, and we can't wait to spend the rest of our lives together! 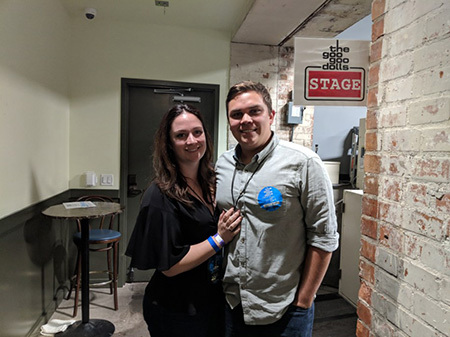 This past July, Sanders and I spent a beautiful Saturday together, enjoying downtown Fargo, visiting some of our favorite places, and ending the day with a picnic at Island Park. When I went to grab plates and cups out of the picnic basket, I found a stack of letters with my name on them on top - Sanders had written over 45 letters in the couple months leading up to the engagement! Each one was so sweet, capturing his thoughts as he was picking out a ring, asking my parents for my hand, and reminiscing about some of his favorite memories of our relationship. The top letter was meant for me to read first, and afterward he got on one knee and asked me to marry him! We can't wait for next June when we both say "I do" and start our life together! We were heading back to Brady’s hometown to visit family one night and had a long drive ahead of us. Along the way, Brady suggested that we stop along the way to look at the stars because it was such a clear night. I had been looking forward to seeing the stars, so I agreed. We pulled up to a lake near his hometown and once out of the car, I immediately looked up to the sky, commenting on how pretty it was and how clear the sky really was. Brady came around the car and got down on one knee, saying he had to tie his shoe. When I looked at him he asked me to marry him while holding up a ring. Overwhelmed with emotion, I, of course, said yes. Travis and I had been dating for a little over two years when we got engaged. Right before the holidays, I came home from work one night to a candle lit dinner and music. After dinner, Travis asked if I wanted to grab a drink downtown. After we had a drink, we walked through Island Park. It was the same week as Christmas, so all of the big trees were lit up, and snow was softly falling. Travis got down on knee, and asked me to marry him in the park. Of course, I said yes! We are getting married this fall in our favorite spot, downtown Fargo. We can't wait to take this step together, and for what the future holds. We were looking at the ocean, little did I know my family had a video set up as well! I looked next to me at Cayne and he got down one one knee. Of course I said yes to my best friend, and he had the exact ring I said I fell in love with! I was in my favorite place, with my favorite person, with a ring I am still obsessed with every time I see it. Royal Jewelers was by far the best place we got to work with in town. 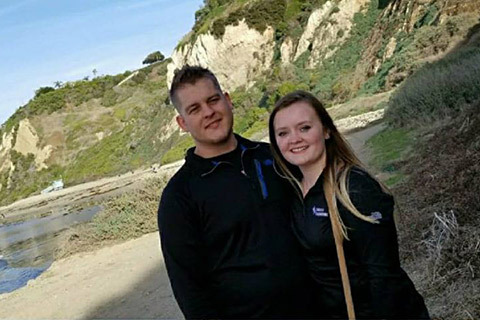 It was important to Cayne and I that we worked with someone who listened to us and our wishes, answered any and all of our questions, and had the high quality we were looking for. Devin is from Massachusetts but came to college at NDSU. He joined FarmHouse which was the same fraternity Brenna's brother was in. Brenna's brother Taylor introduced them when they were freshmen in college. After dating for two years, Devin started looking for a ring. His family came from out east to visit his grandparents over the fourth of July. After supper that night, Devin took Brenna for a pontoon ride. He had made a canvas with pictures of the two of them. In the middle of the canvas it said "When you find the one you want to spend forever with, forever can't come soon enough." 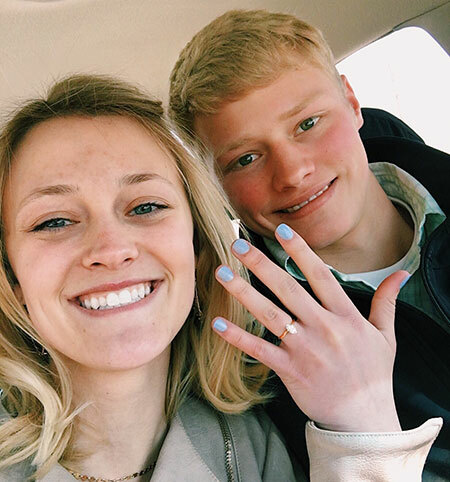 After giving Brenna the canvas, he got down on one knee and Brenna said yes! 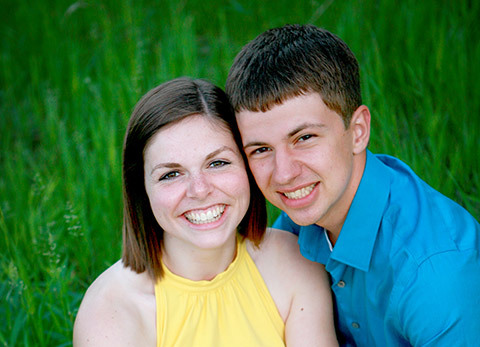 "Amber and Patrick met in hip hop dance class at the University of North Dakota. They started dating after the hip hop class ended in the fall of 2013. They dated for 4 years before Patrick popped the question. 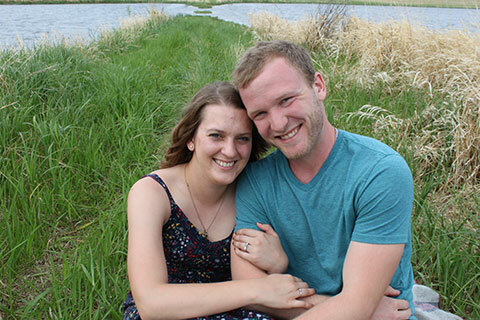 The week prior to their engagement, Patrick drove out to Ambers hometown in Western North Dakota to see her parents. This was extremely difficult to time since Patrick wanted to ask Amber’s parents if he could be part of their family when she wasn’t there. The week before their engagement Patrick got his opportunity; Amber was going on a quick trip and would be gone for the weekend. Patrick was able to ask if he could be a part of the Nielsen household and was welcomed by Amber’s parents. There was only one more question to ask, and it all came down to when and where. 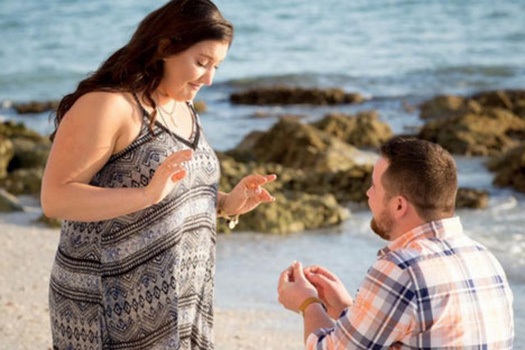 Patrick had plans to replay their first date and propose to Amber at the end of the night. However, the ambience wasn’t right that night, and Patrick decided to delay the proposal. 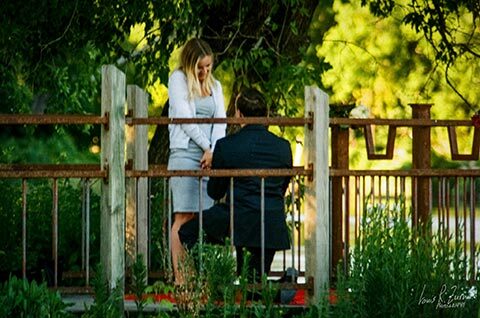 Patrick had the wonderful idea to propose the next morning at the Greenway in Grand Forks. Throughout their time at UND, the Greenway had been a place for relaxation. Due to nerves, Patrick woke up an hour before Amber and started cooking chili. Amber finally woke up at 5:30, and they were on their way to watch the sunrise. Patrick had Amber face the sunrise while taking her picture. As Amber was facing the sunrise, Patrick couldn’t get the ring out of his pocket, so he started counting to three. Finally, as he said three, he was able to get the ring out of his pocket and got down on one knee. 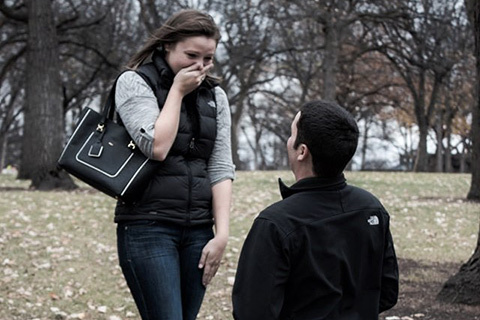 He asked her to turn around and popped the question. She said yes!" CJ and I met 6 years ago when he was stationed in Las Vegas while in the Air Force and I was on a girls trip! He had known two of my girlfriends from High School and decided to join us for a pool day while we were there. From that first day meeting we both knew something big was going to happen between us. Fast forward 6 years, lots of changes with moving, starting and finishing school, and moving in together… we decided to take a weekend trip up to Two Harbors, MN and stay in a tiny cabin on the shore. Andrew and I dated semi-long distance for nearly 2 years. 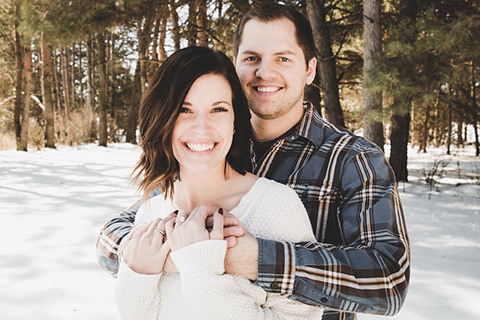 While I was living in Detroit Lakes and he in Fargo, we managed to see each other nearly every day despite both working full-time and I was completing my Master's degree. Unbeknownst to me, Andrew took my parents out for lunch to ask their permission in May of 2017. Knowing how busy and stressed I was finishing my final projects, Andrew promised my parents he'd wait until I finished school. He kept that promise, getting down on one knee on the lawn of the University of North Dakota only 10 minutes after I received my diploma. I was in complete shock, crying and finally understood why he'd been acting so strange all day long. 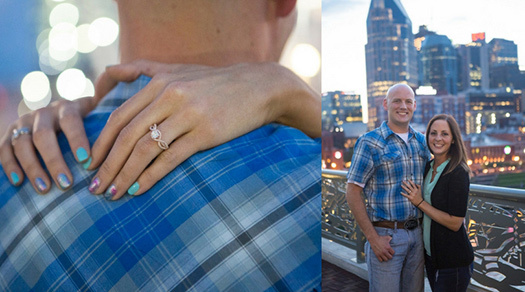 Andrew planned the perfect proposal, inviting my parents and sister to be involved. The cherry on top of this perfect day came that evening. We'd planned a graduation party and invited some friends and family. I was initially really shocked at the amount of people who were driving hours to spend their Friday evening celebrating my graduate school graduation. It turns out that they were all aware of Andrew's proposal plans and we got to celebrate my graduation and engagement in the same weekend! Amanda and I had been together only a couple months when we both decided we wanted to spend the rest of our lives together. Before we approached our nine-month dating anniversary we had already talked about getting married and I was hoping I could propose on that day, but I unfortunately procrastinated in ordering the ring and I didn’t get it on time. Neither of us are fans of traditional white diamonds so I was able to order a custom-made ring with a teal-colored blue diamond that was the favorite color of us both. The ring came in that following week, however, and I didn’t waste any time in proposing the next weekend. I took Amanda out to my family farm for the weekend and I told her I wanted to have a sunrise breakfast with her on Sunday morning. We woke up around 6am on Sunday and I took her to a hilly grassland where my great-great-grandparents settled when they came to America (Our attached picture is us at the grassland). It was after having breakfast, we were talking and I hugged her, told her I want to spend the rest of my life with her, stepped back and popped the question. She immediately said yes. She was completely surprised because I led her to believe I hadn’t even ordered a ring yet; plus, who proposes at 7:20 on a Sunday morning? Something I didn’t expect is that the hour following the proposal, we must have pulled a dozen ticks off of ourselves from that grassland. Although keeping secrets isn't Tyler's best asset, he did an amazing job keeping the journey to finding the perfect ring from me. He said he went to over 10 jewelers before he found this ring at Royal Jewelers for me. It wasn't until a few weeks later that he received the ring. Knowing that ring was going to be in his possession he started to set a plan in place so he didn't have to keep the secret any longer than necessary. I live with a roommate and the three of us just end up doing everything together. I had originally planned for the three of us to take mine and my roommate's dogs for a bike ride. When I had returned home from work after 7 I had expected supper to be ready, but it wasn't. So I offered to make chicken for the three of us, but my roommate declined. As Tyler and I were eating my roommate just got up and started to leave. As she was leaving I asked her where she was going and she explained that she had gotten called into work. I thought that was a little odd, but it was okay with me because I wasn't really all that interested in going for a bike ride anymore. However, Tyler was adamant on going. As we were leaving the garage Tyler tried to grab the ball for the dogs thinking we would stop partway through our bike ride, but I declined and said we would just let the dogs run in hopes that we would return home sooner. Lucky for Tyler I still took our usual bike route rather than a shorter option. As we were nearing the park bench that we usually stop at with the dogs for play time Tyler claimed to have a cramp in his leg. I thought this was odd because we had only gone a mile and a half, and I started to make fun of him. I asked if he was embarrassed for getting a leg cramp from riding bike. He said no. All of a sudden he started grabbing at his pocket and saying sincere words. At that point I started to realize what was going on! I was completely surprised and I of course said yes! A perfect way to kick off summer! Taylor, will you marry me? Sunday morning started out the same as many mornings living above the Watford City Veterinary Clinic. Mike had taken Rose out to the bathroom and Ruben and I were still being cozy in bed. Mike came back upstairs and told me Rose had eaten some wire nuts. I didn't know what those were, so I asked him, and he pulled a couple out of his pocket. Darn it! She wasn't going to pass those. I told Mike there was hydrogen peroxide under the bathroom sink and he could induce vomiting on his own as I was being cozy. Mike pressed harder that wasn't there a shot at this clinic that we could give her? Reluctantly I admitted that yes, this clinic had apomorphine. Downstairs we went, Rose, Ruben, Mike and me. To say I was less than impressed would be an understatement. Once we reached the bottom of the stairs I asked Mike to go and weigh Rose while I turned on the x-ray machine. I was further irritated when Mike did not indeed go and weigh Rose but stood there. I grabbed the computer mouse and the screen turned on. A dog in lateral with what appeared to be a ring in the stomach and several other foreign bodies appeared. I briefly thought to myself "that's a nice ring" as the band showed up but not the diamond. Real diamonds don't show up on x-rays. I also was feeling very sorry for Dr. Mark Foster as he was on call this weekend and had already done a cystotomy and FB surgery. I glanced over my shoulder and Mike was down on one knee. He asked me to marry him and I just couldn't believe it. The evening before Mike and I had gone out to eat with Mark and his wife Brandi. Brandi had recently found out she was pregnant and so we were celebrating. I jokingly had mentioned it could be an engagement party too, but Mike refused to ask me. Little did I know that morning Mike had asked Mark to help him take an x-ray the next morning to propose to me. Sunday morning Mike had waited for Mark to get to the clinic and they had x-rayed Rose together. Rose did not really eat my ring, they had laid it on her side. But she did at some point eat some things suspicious of rocks and/or wire. Since Daniela and I had met, I knew she would be the once I would spend my life with. I wanted to surprise her but since we live together I had quite the challenge in front of me. I wanted until she had a good friend coming to town that I knew I could trust to help me out. When the day came, after some coordination, I was "at work" and she was with her friend. I had everything set up by the pier on the Red River, it was a place I used to go to think and special to me, I had her friend bring Daniela to meet me. Unbeknownst to her, I also had a photographer hiding in the trees to document the momentous even in our lives. She said YES and accepted the beautiful ring I bought through Royal Jewelers. It would not have been possible without their incredible staff. Our story is not traditional as most. On our first date I broke my foot at the street fair and was positive I would never see Matthew again. Instead, Matthew spent every day with me as I healed. After many jokes from myself about going ring shopping one day after the routine joke Matthew said "sure". Within two weeks the perfect ring was found at Royal Jewelers and the wait was on for it to come in. After many days of trying to pry information out of Matthew he managed to pick up the ring without me knowing. Shortly after coming home from work after a trying day for both of us, Matthew approached me and asked if I still loved him. After saying yes, he then asked "How much do you love me?" and presented me the ring. I obviously said yes and it took no time for us to call our family and friends to let them know the news. "David and I planned a weekend getaway camping in Rocky Mountain National Park. We woke up Saturday to clear blue skies and beautiful weather. David made me breakfast over the fire before a great 13 mile hike alongside alpine lakes and scenic vistas. We had such a great day hiking and laughing together. 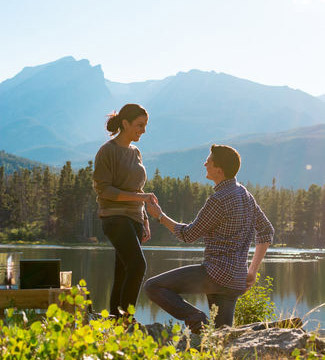 Once back at our campsite, we changed clothes made our way to Sprague Lake to watch the sunset over a glass of wine. The sunset was as perfect as the sunrise earlier in the day with clear blue skies. Just as I sat down on a bench to rest my legs after a long day hiking, David, acting somewhat strange, took my hand and started leading me up a small hill. I was so confused because as we were walking, I saw a photographer moving from behind a rock. David just smiled and kept leading me up the hill. We reached an area where a blanket was laid out with pictures of us, candles, roses, champagne and champagne flutes that had been engraved with our names, date, and location. 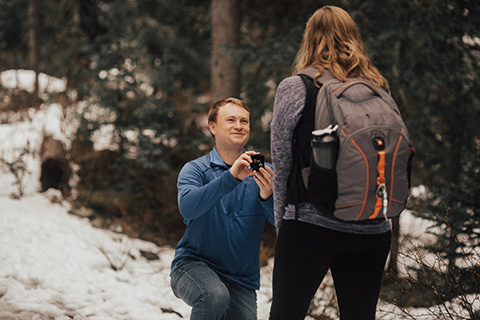 David got down on one knee and asked me to marry him as Taylor and Mike, our fantastic husband and wife photography team, captured the best moment of our life!" 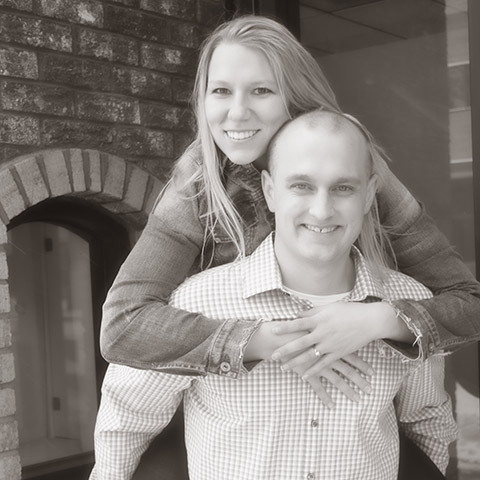 "Tony and I have been together for a little over six years when he decided to pop the question! He surprised me with a trip to Rome, Italy in May. The whole time we were there walking around the city, Tony had the ring in his pocket just waiting for the right moment to ask me. On our second to last night, we went to dinner at Villa Miani which over looked the city of Rome. After dinner Tony said let's go to the roof top to enjoy the views. There, on top of the roof top terrace with Rome's beautiful lights and the Vatican's Basicilla Church in the background, Tony got on one knee and asked me to marry him! Of course I said yes!! It was an amazing moment that I will never forget!" 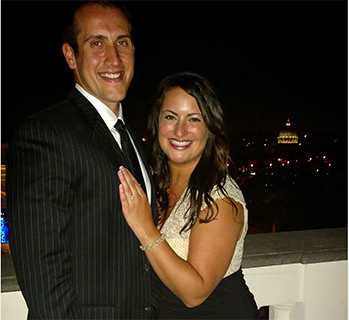 "Jack and I took a much-needed vacation after I graduated my program and passed my board exam. We headed out from Minnesota to Montana to do some hiking, rafting, touring, and horseback riding. We had been together for a while so I had a feeling a proposal was coming on this trip. Some unexpected and untimely snow delayed our hiking trip until the last day of our vacation, but we made it out to the gorgeous trail right after a rain shower. The further we hiked, the more anticipation and excitement I felt. However, before I knew it we were back at the car- the hike was over, and there was no proposal. I felt disappointed, but tried hard to dismiss it because I really did have a fantastic time simply hiking with my best friend. 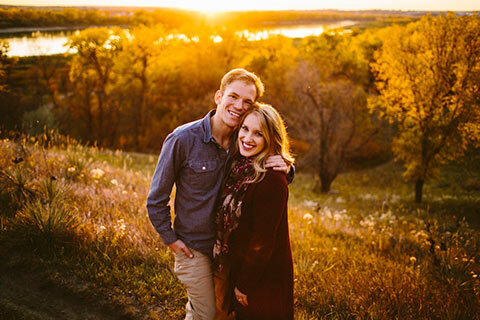 "Eric picked Island Park in downtown Fargo to propose. Our favorite date nights are always spent downtown, and Island Park is such a beautiful setting in the Fall as the leaves were changing. What I thought was just a walk through the park turned out to be so much more as Eric went down on one knee. 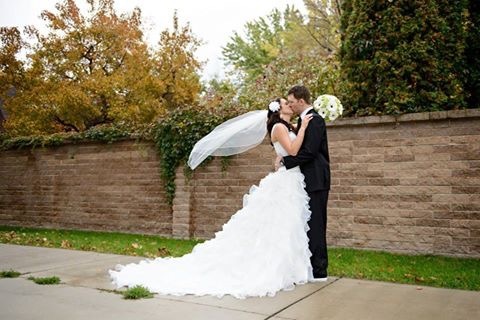 I loved how thoughtful he was in asking my dad's permission first and making sure to capture the moment with a photographer on site so that I would be able to cherish the moment and share it with my friends and family." 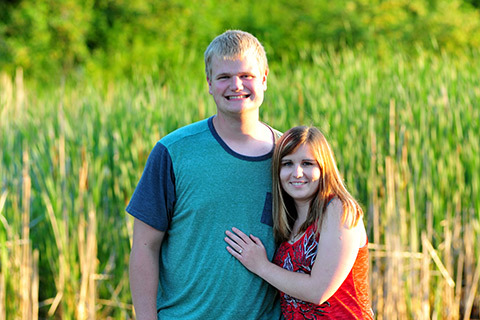 "Nick & I had been together for quite sometime prior to our proposal. We were long past the stage where everyone would ask when we were going to get engaged. About two years before Nick proposed we went ring shopping. While at Royal Jewelers, we found "the ring." It was perfect in every way. Nick spoke with Royal and chose the center stone. It even served as the screen saver on Nick's computer for a few months after the shopping trip. Then some time passed - days, months, years! 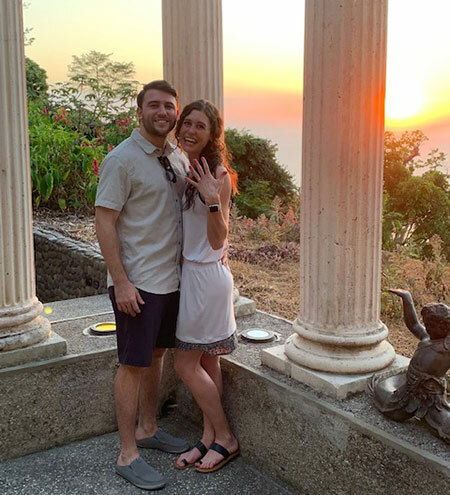 When Nick finally decided the time was right to purchase the ring, he made his way back to Royal and "the ring," center stone and all was still waiting! Talk about meant to be. Halfway through May of 2013, I was wrapped up in studying for the bar exam, and Nick had just started working a new job in Bismarck. We were doing a puzzle one evening (a typically rainy day activity for us). About 2/3 of the way through the puzzle, I said I was tired and was going to go to bed. Nick convinced me we were almost done with the puzzle and should just finish it. I thought it was kind of odd, since he is usually not so passionate about puzzles, but I reluctantly agreed. When we were wrapping up the puzzle, we realized there was one piece missing. I was annoyed - we just opened the puzzle that evening. I started to search under the couch cushions -thinking the piece couldn't have gone far. I turned around and Nick was down on one knee with the ring and missing puzzle piece! I instantly started crying - filled with emotion at the unexpected turn of events! Nick had a speech prepared which concluded with him asking me to fill the missing piece in his life and be his wife. I of course said YES. With shaky hands and a new piece of hardware, I put the last piece in the puzzle. We have that puzzle framed and hanging in our home today." 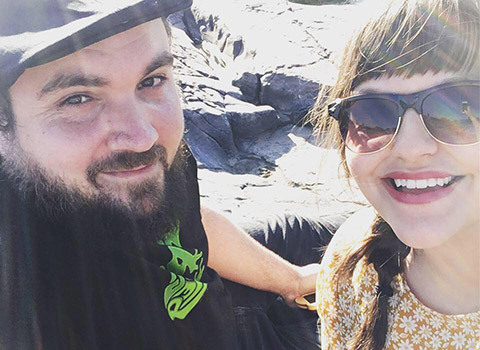 Jason and Natalie had both wanted to visit Nashville for as long as they could remember, so they finally decided to book a trip. The day of their trip they had 4 flight delays and a gate change. 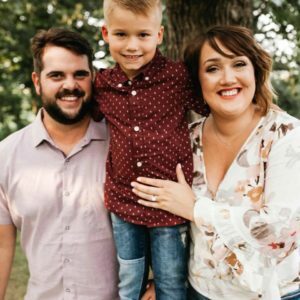 Unbeknownst to Natalie, Jason was planning to propose on their first night in town and had even hired a local photographer to capture the whole proposal! While Natalie was blissfully unaware, Jason was frantically texting and calling the photographer with every flight change. Almost 2 hours later than planned, Jason and Natalie landed in Nashville to pouring rain. Jason told Natalie she had 10 minutes to get ready and they had to go because it “was a super cool view that she had to see”. Their taxi pulled up to the pedestrian bridge over the Cumberland River with a view of downtown Nashville. Jason asked Natalie to turn around so he could reenact a similar panoramic picture from a previous vacation in Las Vegas. 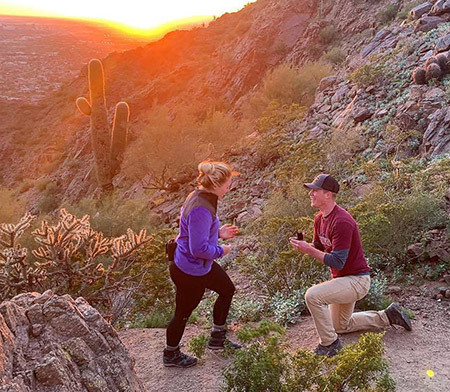 While she was looking towards the downtown landscape, he got down on one knee, pulled the ring box out of his boot, and then told her to turn around. The rest is history! Ben and I had headed to Florida for our first "real" vacation together. We spent 2 days in Miami and then we met up with his family on the 25th [of March]. After a long day of driving 3 hours to Marathon, all I wanted to do was go to a beach. So we all headed to the beach after supper. Ben had been keeping his eye out on the ocean and low and behold he saw some dolphins jumping out just off the shore a ways. So we all ran over to where we could see the dolphins a little better. Then Ben said 'Let's take a picture with the sunset, water and dolphins in the background.' I said "Okay, sure!" Then out of the corner of my eye I see this box in his hand and I turned to him as he was getting down on one knee and I said, 'WHAT ARE YOU DOING?' (I was very surprised) and he says, 'Will you marry me?' And of course all I could do was say, 'YES! "On a family trip to Ixtapa, Mexico everyone was together eating at The Catalina. As the sun was starting to go down everyone taking pictures with one another, and as Kyrstin was looking out at the sunset Robie came up behind her and went down on one knee and proposed. Robie is quite the jokester, so Kyrstin’s first response was “Is this a joke? 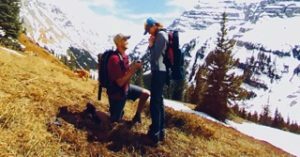 Are you serious?” As we all laughed and she finally realized it was real she jumped up and down in excitement and said yes. It was the perfect moment in the most beautiful and memorable destinations. 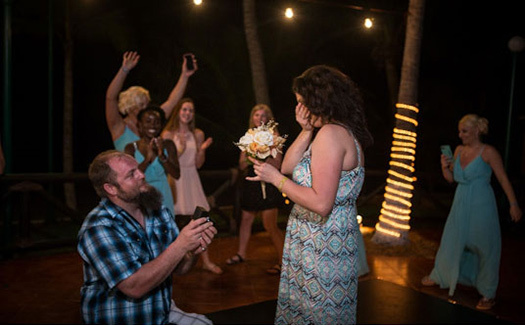 A year later, the couple, along with 60 friends and family came together where it all happened back in Ixtapa. Kyrstin and Robie were married on the incredible beach of Ixtapa. They danced the night away, and when it came time to do the bouquet toss Kyrstin was getting ready for a special surprise. As everyone counted to three, she turned around and handed the bouquet to Tannis. At that moment Tannis turned around and Jeremy was on his knee proposing. 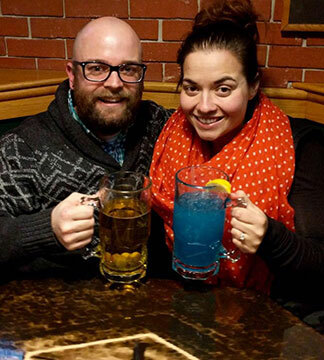 "One night Jeremy and Tannis were at the same bar, and Jeremy was waiting for an MMA fight to start. They randomly caught each other’s attention and hit it off from there. They started spending more and more time together and fell deeply in love and started a family. They had a son, Silas together and he is the center of their world. Tannis and Jeremy went to Kyrstin and Robie’s wedding in Ixtapa, and Silas was the ring bear. 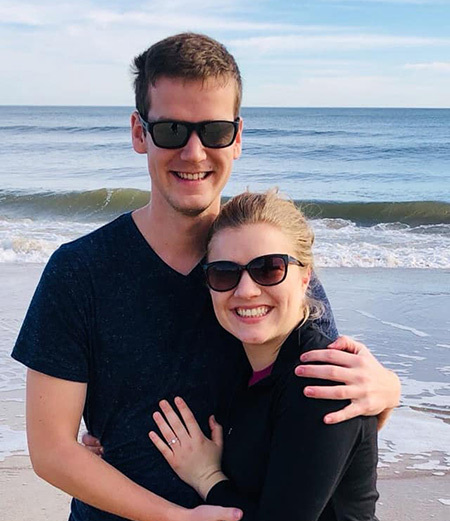 Jeremy had gotten so much positive feedback from Kyrstin about Royal Jewelers, even though he lives 3 hours away, worked with Kelsey at Royal Jewelers and designed Tannis the perfect ring. Jeremy knelt behind Tannis as Kyrstin was handing her the bouquet with his Royal Jeweler’s box open and ready. She was speechless and shocked; tears of joy were filled in everyone’s eyes. It was the perfect moment and their most memorable trip so far." 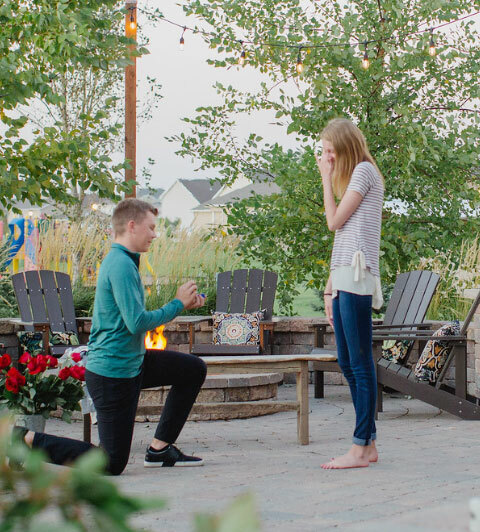 Please fill out the form below to share your proposal story with us at Royal Jewelers and receive a lovely set of champagne flutes as well as being featured on our website. I agree to allow Royal Jewelers to publish my story on social media and in marketing campaigns.